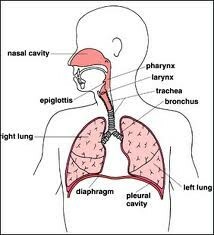 The respiratory system is the system that works with your lungs and other organs to help you breath. The goal of is to take in and deliver O2 to the body and remove CO2. Diaphragm: The diaphragm is located above the ribs and consists of a thin sheet of muscles. It assists in breathing by pulling and pushing the lungs up and down to expand or contract. Intercostal muscles: These muscles lie between the ribs and help with the mechanism of breathing, including pushing and pulling the lungs to expand or decrease their capacity. Abdominal muscles: The abdominal area assists people breathe when under pressure, such as running or stress. They assist the diaphragm and intercostal muscles to move much faster and with greater force. In this animated movie, you’ll find out why your body needs to breathe, how your lungs work, and the function of your diaphragm. Learn how oxygen gets into your blood, plus how and why you exhale carbon dioxide!